* Upon clicking this button, you will be redirected to the official Coral Club online store, where you can check product’s current price as well as its availability. 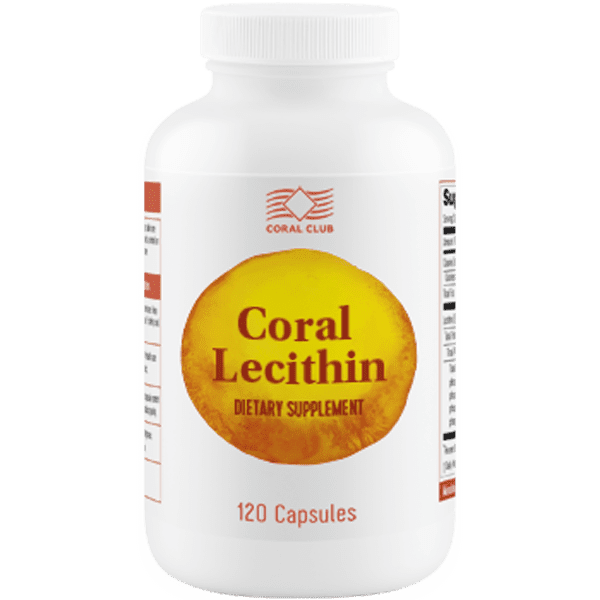 Coral Lecithin is a natural product, which contributes to the development of full-fledged operation of the Central nervous system, normalizes the heart and liver. One of the generic supplements that are necessary for all organs and systems of health, including Central nervous system and digestive organs. It is one of the most versatile bioactive supplements. Leci­thin is the basis of all cellular membranes in the human body where it is used to rebuild damaged cells. The main components of lecithin are choline and inositol. They are vital for the normal functioning of the brain. Choline coordinates muscle contrac­tions, mental activity, creativity, and memory. Inositol improves the mood, behavior, and naviga­tional skills. It also has a sedative effect, reducing anxiety and irritability. Lecithin is indispensable for the proper functioning of the heart. It reduces the amount of cholesterol, improves blood flow and circulation. It can also in­directly affect blood pressure. Lecithin actively regulates fat metabolism, break­ing down fat into simple acids. As a consequence when there is lecithin, lipids quickly cleared from the liver, which regenerates more quickly af­ter damage caused by alcohol, nicotine, medica­tions, narcotics, food preservatives, and dyes. It also plays an important part in the im­mune system by restoring the function of lympho­cytes and macrophages and enhancing disease resistance through the production of additional an­tibodies, and stimulation of the activity and growth of phagocytes. Lecithin is also one of the primary drivers of the reproductive function and is especially important for the proper development of the fetus and newborn babies. It strengthens and restores memory, improves the ability to perceive children, especially those with cognitive and learning disabilities. The other benefits of Lecithin include antioxidant protection of the skin against free radicals. It also helps the nutritional and detoxification processes activates the lipid metabolism and stimulates the growth of new skin cells. Lecithin (soybeans) extracted 1200 mg.
How to buy a Coral Lecithin?